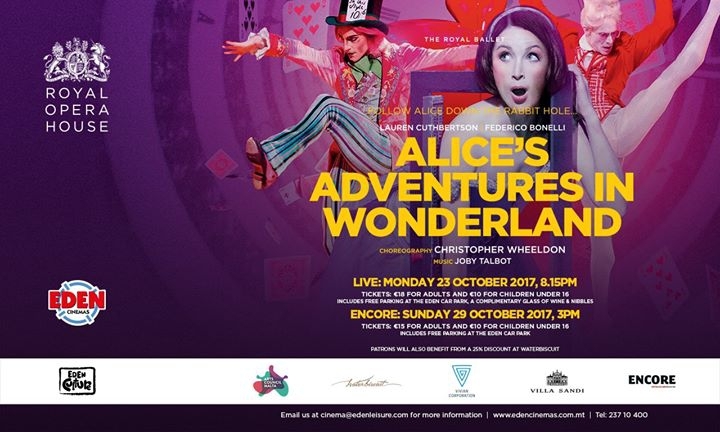 Tumble down the rabbit hole with The Royal Ballet this autumn with Christopher Wheeldon’s exciting Alice’s Adventures in Wonderland LIVE at Eden Cinemas on Monday 23 October at 8.15pm. The original cast takes to the screen in this madcap adaptation of Lewis Caroll’s story. Exuding a girlish charm, Alice, danced by British Principal Lauren Cuthbertson, is joined by a host of familiar characters including the jittery White Rabbit, the eccentric, tap-dancing Mad Hatter, the enigmatic Caterpillar and the ferocious Queen of Hearts. A feast for the senses, Wheeldon’s spectacular ballet brings to life Carroll’s famous story with a menagerie of colours, characters and compelling choreography, whilst Joby Talbot’s lively score provides the perfect accompaniment to the ballet. For those unable to attend the live show, an encore screening will be held on Sunday 8th October at 3pm. Tickets are priced at €15 for adults and €10 for children, including free parking and 25% discount at Waterbiscuit.